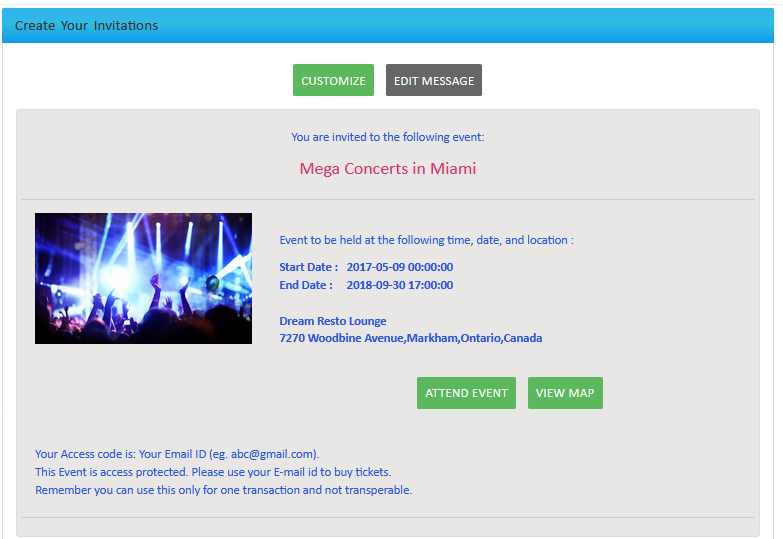 TicketGateway allows you to invite guests to your event. In this section you can create custom templates and send multiple invitation emails to potential guests. How To Invite Guests To An Event ? Select on the “Manage Event” section. You can customize the event template by using the “Customize” option. You can save this guest list as a draft for future use or send invitations to guests right away. You can add guests by clicking button. A small pop up will open to enter the information. Upload CSV : You can upload exel file in csv format for sending bulk invitation. To understand the updated format you can simply download demo csv. file. Enter Data Manually : Here you can enter emails separated by commas or line breaks and click on save button. You will see your added data here. Now you can send your invitation and also you can save it for future. TIP: You can manage your guest invitations in the “Manage Invitations” section. There you see the scheduled emails and drafted emails. If an email sending is in process then it will be under “Scheduled.” It will be clear after some time. If you save the email template then it will be under “Drafts”.